Section menu "File \ New" This type of test is designed to test the knowledge of school staff or the company. The test results exhibited through evaluations or by using the scores. Parameters On the left is a list of all parameters. It is divided into three parts. To change one of them, double-click or press «Enter» to its name. Subject - the name of the object or select it from the list. To make changes to the list, open the file Subject.txt. Name of the test - When testing, the name will be displayed in the program header. Enter password - The first password is needed to ensure that no one except you could not make a change in the test. 1) They will ask all the questions - If you want to ask all the questions, this option should not be changed. 2) It will ask: - For example 20. 3) Number of tickets - For example 4. The program is divided to 100 4, get one ticket for 25 issues. Then randomly selects a ticket, say №3. This means that will be asked to №51 on №75. Remember one rule - the total number of questions must be divided by the number of tickets without a trace. If you click on the menu "File \ Start over", the program will open the ticket that the pupil had not yet seen. Once all the tickets are selected, then all starts again. This option, if you include the previous function "Number of tickets". 1) Random selection - The choice of a computer ticket. 2) Selecting a ticket for students - The student will be able to choose the ticket number. 3) Selecting a ticket or student or computer - Combining the two previous modes. Compiled test - Enter your name, as desired. Part 2 Show questions in random order - The program will show the first 20 questions. If you check, then randomly selects 20 questions out of 100. The index of random - This option, if you include the previous function "Display questions in a random order." Before testing, the students have to enter the same number from 1 to 999999. In this case, the program will select the same 20 question for all students that will put them in a completely equal footing. If you enter zero, then the index is set at random. Time - If the time for solving the test is limited, then enter the hours or minutes. Compulsory saving results - Before starting the test the student must open the file (*.rez), in which the result will be saved, and enter their name. Do not forget create table of results. If for some reason the program will not save the information, then instead of evaluating and interest appear question mark. In this mode, I advise not to include the "indicator of true answers." If a student does not pass the test to the end, in the table of results it will put a dash. Enter password - The student will not be able to open the test yourself. When the first and second password must not be the same. Suppose there are several tests and they have the same passwords. Then, simply enter your password once, they are free to open. Retake the test - with the permission of the teacher - If you select this option in the program will request a password each time you open the test. 1) Do not encode text - Normal mode. 2) Encode text into Morse code - During the test, the letters in questions and answers will be replaced by dots and dashes ( ). 3) Encode text into semaphore code - During the test, the letters in questions and answers will be replaced by pictures of flags ( ). Show [?] After the correct answer is not - help will be shown only after the student did not give the correct answer. 1) By clicking on the "Show all questions with answers", enter your last name, then the program will show all the questions that you answered. Then click "File \ Save in HTML". To see all the answers, select "File \ Show entire test". 3) Scores - For every question to set the corresponding score. Parameter will be shown «Show scores student». If you turn it on, the test will see how many scores he will get by giving the correct answer. As a result, scores of questions to which answers are correct, are summarized. Some parameters are disabled: «Assessment», «Commentary on the estimated», «Without ratings», «Calculation of percents». Note: tests training set scores are opened only in the program with the version 18.1 and up. As well as the results of tables of these tests if they contain unchecked answers. Let's say the student scores 75%. We are looking for an assessment with a percentage of less than or equal to this result. 70% less than 75%, then the pupil will receive an assessment B.
Commentary on the estimated - You can add text for each evaluation, which will encourage the student. No assessments - This function allows you to load tests, which do not need to put the assessment. The only criterion for the test is the number of correct answers in percent or in scores. The parameter "Test is handed over" sets a lower limit for the test. Example: "Test handed" = 50%, in test 5 questions, each of them is 20%. The first student answered correctly 3 questions, 3 * 20% = 60%, 60% more than 50%, so its result "Test put." The second student replied right to question 2, 2 * 20% = 40%, 40% less than 50%, the result "Test is not handed over." Test is handed over - When the program understands that the student will not be able to achieve a minimum percentage, then the test is stopped. After passing the test, the program tells you the test commissioned or not. Calculation of percent - The program provides two ways which one to choose, decide. 2) Calculation % for each account - 100% divided by the number of issues that still divide the number of correct answers for each question and multiplied by the number of correct answers pupil data. Example: Test 2 question. In the first issue of 5 correct answers, the student responds to 3. The second question 1 correct answer, the student is responsible to it. We believe: (100/2/5*3)+(100/2/1*1)=80% But if the student will answer more than the number of correct answers will receive 0%. 1) Examination - This mode verifies the knowledge of the student. 2) Education - counts only the first answer. If not given the correct answer, there is a "hint", clicking on which you can see the correct answer and only then move on to the next question. When you select the test "Education" in the upper part of the program will appear picture book. 3) Selecting students - The student will choose the mode. 4) Learning - the program shows the question with the correct answer. Take the first answer - This option must be installed for the test, in which the student after the answer given was not able to change it. Indicator of correct answers - In the center of the indicator on a white background, you will see the amount of interest accumulated student. If answered correctly, the program will display a green background, with no right red. If the student gave only part of the correct answers, then the background will appear yellow and the words, such as "2 of 3", but that the second method of calculating the percentage of correct answers. This option works if the option "Do not show the results of the exam" is not included. If you need to change the settings in several training tests, then click "File \ New" or open ready to test, enter the password, click the "Test \ Settings". Configure and remember that the password of this test must match the password of the other tests, click "Accept". Now, in the menu "Test \ Replacement options files", select the files you want and click "Accept". Will be marked in green the processed files, and files that change red failed. What is around the head? What elements are included in the formula of water? The author of the work "Eugene Onegin"
Place the color of traffic lights from top to bottom. Help is additional information that is indicated by a «[?]». Fast loading test Enter all of the text in Word. 1) At the beginning of the question with one or several correct answers the sign "#". At the beginning of the correct answers sign "+", if them more than one. 2) At the beginning of the issue with a permutation of the responses, the sign "@". Responses must be in the correct order. 3) At the beginning of the issue of conformity sign "=". Between the left and right part of the answer register a double equal sign «==». 4) After the question span multiple lines sign «/». At the beginning of aid sign «?». Insert it into the program, make sure that the answers took only one line and then "Accept". ALL !!! TEST READY !!! Or open Test_en.znn, password 123. The program can start downloading the text with the first question or the one where you are. Example: Once again File \ New , enter any naming test and password, the total number of questions is already two, "Accept" button. 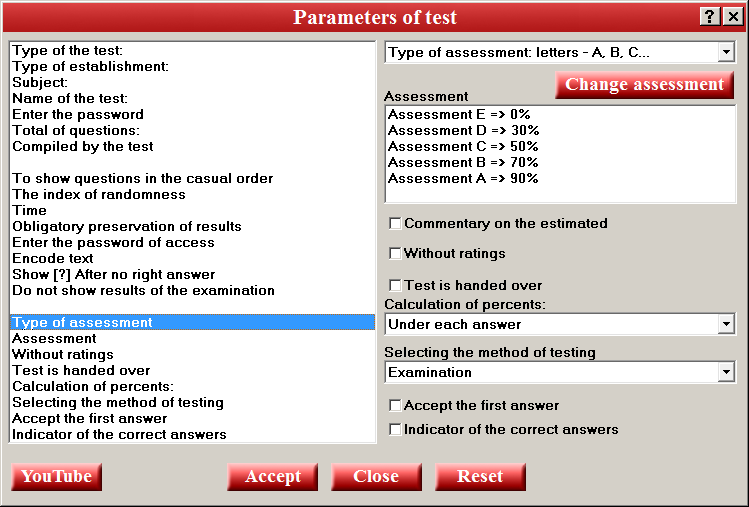 F4 , select the second question again Test \ Fast loading of questions and answers, insert the same text, "Accept". Click Back and you will see that the question №1 remained empty. Test \ Edit the entire test - This menu item will remove the test back quickly and correct errors. If you want to view or print the entire test it, then Test \ Show entire test. 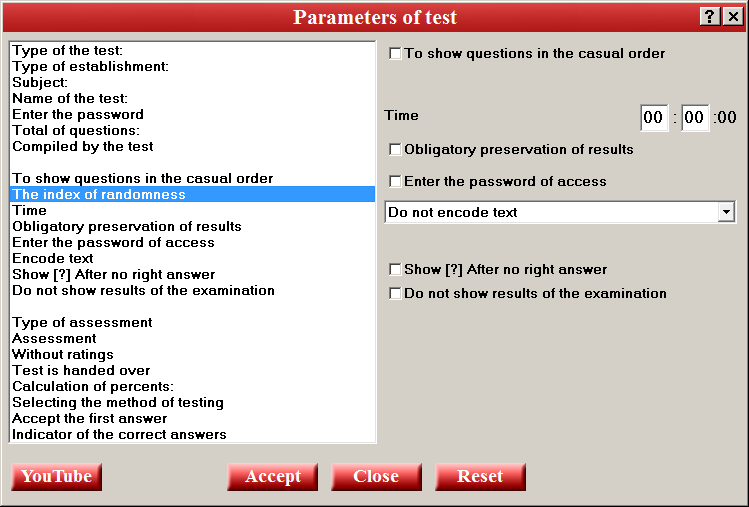 A question separate, the answers separately If the questions are recorded separately from the answers, in this case all the answers to the students entered from the keyboard, then execute two actions: 1) Test \ Fast loading of questions and answers insert a question, 2) Test \ Fast loading only answers insert answers. Normal loading test Please enter a question and choose the type of question. Type of question: Select the answer - Enter the answers and correct answers before the rooms include light bulb . If you turn it all answers, the student will be entering one of the answers from the keyboard. At the opening of the test with this question, the program with a version less than 17.3 will report "The test is not ready." Type of question: Rearrange the responses - There are issues that need to rearrange the answers. For example the question: "Place the color of traffic lights from top to bottom.". You load the answers in the correct order, 1) Red 2) Yellow 3) Green, when testing the program itself moves the answers. Type of question: Question to meet - The question "is the capital, in accordance with the following countries:" Between the left and right part of the answer register a double equals sign "==". Answers: 1) Russia==Moscow, 2) Germany==Berlin, 3) England==London. To answer part of the question, or to move to a new line, press the Ctrl + Enter , and to move the text to the right of Ctrl + Space . All that lies between the signs are not equal < ... > code is considered a web page and not shown. To solve this problem, click Ctrl + T . There may be situations when the plain text, when tested, the program shows otherwise. Select the text, copy it. In the Edit \ coded text in the tags , paste the text and click "OK". Insert text, replacing vydeliny. In the Edit You can insert pictures into questions and answers. And here's a video or audio-only files in question. Press F4 and you will see a list of questions. To split one file into several files, the number of tickets click on the menu "Test \ Divide the dough for the tickets." To combine several tests, the first open test, save it under a different name, if necessary, then press the menu Test \ Test Add . Remember that the basic parameters are stored in the first test, but the total number of questions. Click Ctrl + P and check whether all's right. There are times when you need to move the question from one test to another. To do this, click the "Test \ Copy issue." The next menu item "Test \ Copy few questions" all you have to do is mention the right questions flag. To continue the download test, after the break, click File \ Change , and enter your password. "Test \ Remove the type of questions" - a total of five types of questions: 1) The issue with one response. 2) Question with multiple answers. 3) The issue of permutation answers. 4) The issue of the right of the permutation answers. 5) The issue with the introduction of a response from the keyboard. To begin testing, open a test. 1) Will ask all the questions - Print the entire test. 2) It will ask: - Enter the required number of questions. Post a question № - With this number the program will start the choice of issues. 3) Tickets № - If the test is divided into tickets, you need only select the number. Show questions in random order - The program moves the questions or choose them randomly. Show answers at random - Change the answers sometimes. Question for compliance column - If you remove the check mark, the answers will be divided into two lines, which saves space. The first line of the left side of the responses in the second right. Show only correct answers - after printing, the test can give students to study. Click Menu \ Save in HTML. Author site: Alexey Murtazin, established june 20 2015.